Who can resist this cute monster eyes? Definitely not me! Accessoires and makeup in bright pink are a must for this look. This friendly monster wants to be hugged and stroked all the time. evil ex-boyfriends or nasty neighbours. 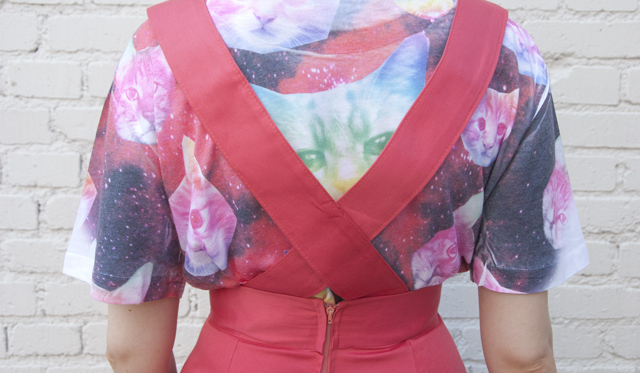 The cats are playing hide and seek behind the braces of the high-waisted skirt. This comfortable jelly sandals in lilac are the perfect shoes for hot summer days. This look is a mad liaison between the 50s and the 90s. A little bit of retro, a lot of craziness. Galaxy cats are floating through a rainbow coloured sky, while the cute furry monster twinkles with its long eyelashes. Nineties neon disco meets pink vintage chic. Yes, today I let styles clash together and mix wildly, what doesn't seem to fit at first. You've seen this high-waisted pinafore skirt before here, I styled it to a genuine retro look. I wondered if it would look good in a more quirky outfit as well and was surprised how well it goes together with the cosmic cat print. The tee is quite long and it doesn't look good on my curvy body if I wear it loose, but tucked into the high-waisted skirt the silhouette is accented to flatter. The true star of the outfit is the clutch: I wrote about British fashion designer Joanna Pybus before here and this is her first piece I own. 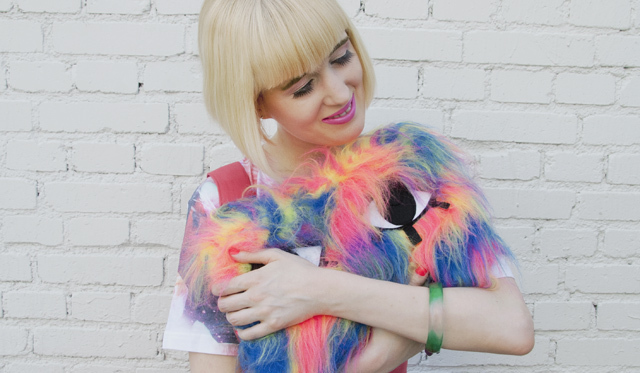 I love the cute monster and always catch myself stroking it. I was tempted to not show my face at all in this post, because it's just too much fun to hide my face behind my monster. 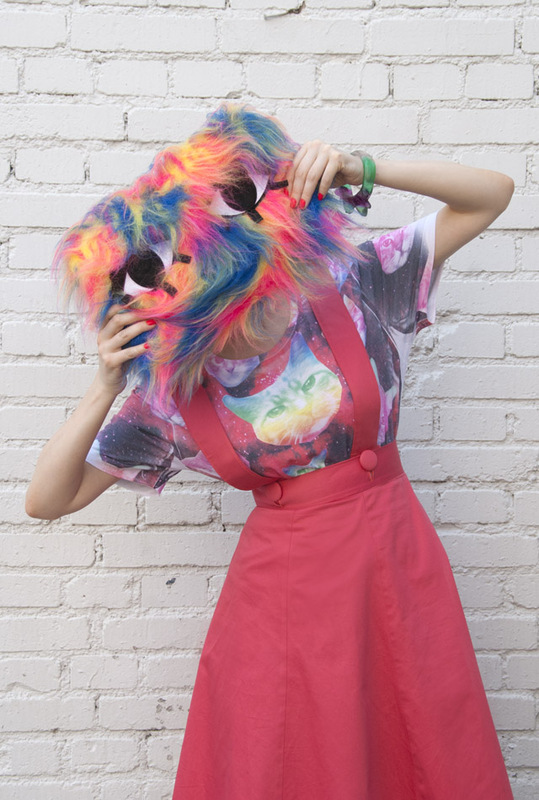 Do you like this crazy look? Total geniales Outfit!!! Die Tasche sieht soooo schön flauschig aus! Der Rock ist so schön ♥ der Schnitt, die Farbe... einfach ein Traum! Vielen lieben Dank schöne Frau <3 Der wäre auch was für dich. Die Schneiderin macht die Röcke nach Massen, sie sitzen wirklich perfekt. This jumper skirt is amaaaaazing! Your looks are always so incredible. And I have those jelly shoes - they're the cutest! WOW such a crazy look, but it's really cool! I like your blog. Maybe you can visit my blog and follow me on gfc and bloglovin. I don't like it... I LOVE it! der Rock ist ja wohl mal großartig, da schlägt mein Herz höher. Nun heißt aber erstmal für mich: KAUFVERBOT =(. Jaaaaaaa ich liebe die Tasche <3 :-D Es gibt sie noch in anderen tollen Farben. Me encanta el conjunto, la falda es muy potente!! Te acabo de descubrir y ya me has enganchado! Many times the crematorium facilities will allow for a special blanket or toy to accompany the pet and some crematoriums now have waiting room facilities or facilities that allow for a witnessed private cremation.